This product offers one autograph and two relics in every box. I did get that combination and when you hear who I got I think you will say I got a decent but not great box. I managed to get 22 rookie cards (all serial-numbered), which breaks down to more than 1 per pack (18 in a box) four of them were low numbers and the rest were numbered to 2009. 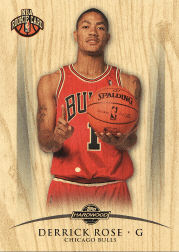 The best of the bunch was the potential rookie of the year and last year’s top draft pick - - Chicago’s Derrick Rose. The card is numbered to just 299 and this kid is averaging 16.7 PPG and 6.3 assists! Kevin Love (T-Wolves), Russell Westbrook (Oklahoma City numbered to just 175!) and Donte Green (Kings) are all solid cards. The rigid feel of the cards fits with the set.